This southern Italian red is produced by Mondo del Vino, who have winemaking operations in many key production areas througout the country. Rinforzo (“Reinforced” in Italian) is a winemaking method where the harvested grapes are partially dried in temperature and humidity controlled chambers for the purpose of concentrating the grape sugars and flavour compounds pre fermentation. This is similar to the Amarone winemaking method used in Northern Italy. This is a rich and complex red from sunny Salento, Puglia. Notes of dried plumes, dark chocolate and Mediterranean herbs fill the nose. The palate is opulent and flavourful. This is a wine for those who love that concentrated luscious style and it’s flavour intensity makes it an ideal partner to serve with mamma’s spicy pasta with meatballs or a hearty lasagna. 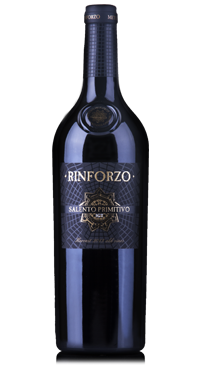 Our Primitivo Salento IGT Rinforzo 2013 received the gold medal at the Concorso Enologico Internazionale Vinitaly 2015. Rinforzo was the only one to win the golden medal among all Italian reds of the latest 2 vintages (2013-2014).